History has its pivotal dates (usually marked by cataclysmic or highly significant events) which serve as reference points used to separate one time period from another. In Biblical history it was the great flood in Noah’s time, the Babylonian captivity, and the birth of Christ. In world or national history such markers are usually major wars which change history by causing political, sociological, and economic upheaval. our house and most of our personal possessions were quickly destroyed by a fast moving wind driven fire storm. We now refer to our recent personal history as “before the fire” and “after the fire”. The fire occurred just as we were gearing up for another busy year of market garden farming. 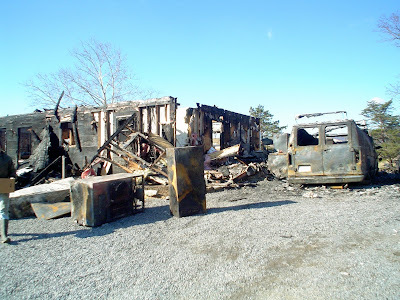 We lost not only the house and most of the contents, but also a market delivery van, a car, an all terrain vehicle, a greenhouse, virtually all of our shop and garden tools, and our saved and “just purchased” seed supply. A tractor and another greenhouse were damaged. We had begun construction on a new packing shed and pole barn which we were hoping to have completed by early May, the beginning of our CSA and produce marketing season. Suddenly, what had begun as a fairly normal year with daily routines of farm chores, beginning of year planning, and getting a little extra rest, had been literally blown apart. We were deeply touched and blessed by the generous response of the community around us, the extent of which we hardly realized we had. One week following the fire our son and law organized a group of about 30 carpenters, cooks, and willing workers from our local church and neighbors to do a “barn raising” to get enough of our packing shed, pole barn, and greenhouse up and under roof, allowing our growing and marketing season to proceed somewhat on schedule and the first hay cutting to be stored out of the weather. Several weeks later another group, including some EMU college students, assembled to help clean up the garden strips and help prepare for spring planting. Friends and relatives in the local Old Order Mennonite community, in addition to our local church, donated used clothing, home canned food, frozen meat, tools, and heirloom seeds, and helped us financially to purchase expensive tools like a chainsaw, weed trimmer, and even some furniture. CSA members gathered together a used computer, and a riding lawn mower in addition to money. The local Kurdish community planned a picnic and made financial contributions. Several of my seed suppliers donated some items and replaced some of my lost seed at no or reduced cost. Several of my brothers took it upon themselves to haul away the damaged tractor and to repair it. Another group organized to assist with demolition of the ruined house and a neighbor whom Christine has helped with milking chores over the years, lined up a contractor to begin the house reconstruction. To all of these people we owe a deep and heart felt “Thank you!” not once but many times over. What they all did collectively made a tremendous contribution to our recovery and reassured us that even in our time of social and economic independence, community is alive and well. We are grateful for the efforts we have made to build community in the past and somehow we will find ways to return some of this help to others in need in the future. · Crops that did well and produced abundantly—12. · Crops that produced something but were not worth bragging about—18. Despite it all we had enough to eat, there was something to put into the CSA boxes every week, and I had something to sell at the farmers’ market until late November. It has been tough, but God is taking care of us. We are blessed! May this letter find all of you who are receiving it also blessed this special season.